Displays multiple indicators, across multiple timeframes and symbols to give a comprehensive overview of the market. Uniquely, the indicators are configurable and can include custom indicators, even those where you just have the ex4 file or those purchased from Market. Standard indicators can also be selected, the default being ADX, CCI, market price above/below Moving Average (MA), Moving Average Cross (MAX), MACD, Momentum (MOM), OsMA, RSI, Parabolic SAR, William's Percentage Range (WPR). 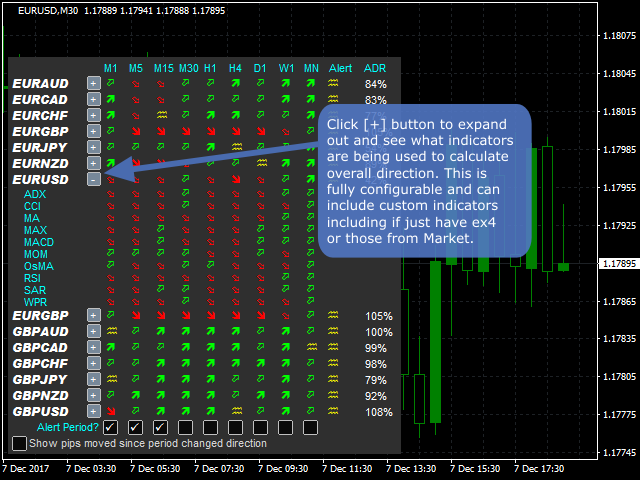 Use [+] button to expand symbol and see readings of each configured indicator. The product will also alert when selected timeframes change direction, which can take place when only multiple timeframes are in agreement. The last alert direction is shown with number of pips moved since the alert. 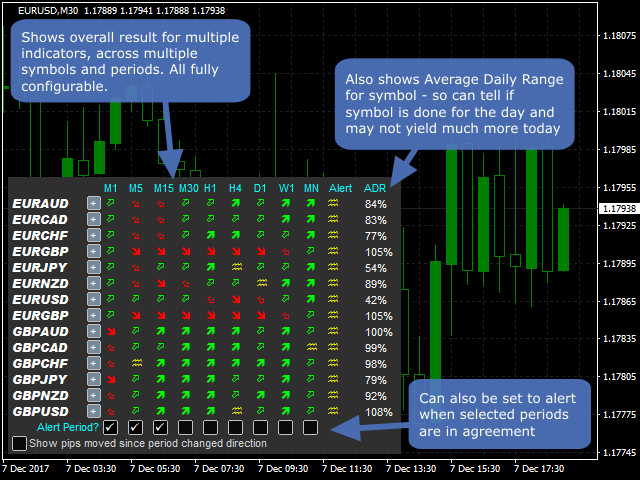 The Average Daily Range (ADR) is also shown, so can tell if symbol is 'done for the day'. 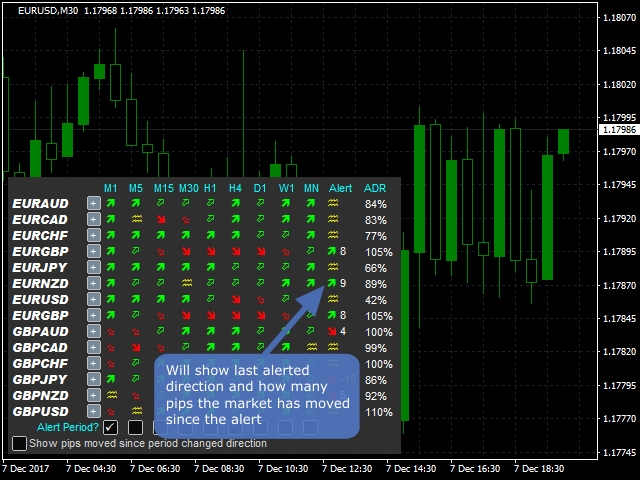 Optionally, can also display the number of pips moved since the timeframe changed direction. The dashboard shows solid arrows if all indicators are in agreement (depending on Important_alertThresholdPercentage input) or hollow arrows if majority. The properties of the standard indicators can be changed via the indicator inputs and a wide variety custom indicators are supported. Notes when using strategy tester: Alerts will appear in the Journal tab. Indicators on the weekly and monthly timeframes may not be calculated. Important_symbol - Symbol to show information for, comma separated. Can also specify currencies. Important_symbolsExclude - Will exclude symbols that contains any of the items, e.g. exotic currencies. CustomN_indicatorName - Custom indicator name as appears in Indicators folder in your MetaTrader Data Folder. CustomN_indicatorDisplayAs - Indicator name to display as in the dashboard. If left blank then will truncated CustomN_indicatorName. 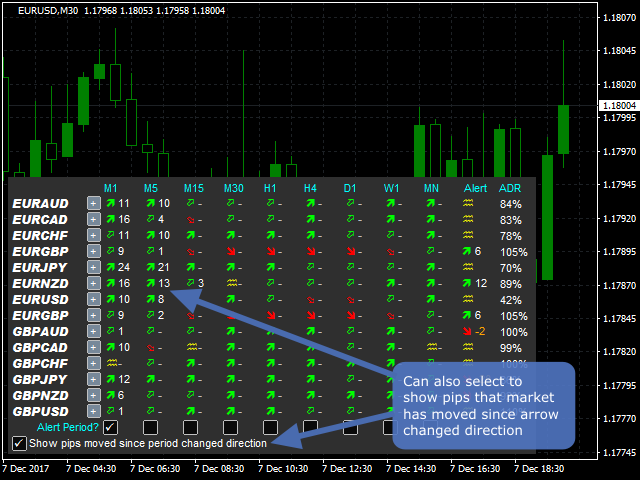 CustomN_shift - Candle shift to use for indicator capture, where 0 is live candle and 1 is most recently closed candle. CustomN_midPoint - Mid point to be used if only one color index is supplied and gives the indicator value that represents the transition from buy to sell. CustomN_nullValue - Null value to be used to decide if the indicator value should be ignored / regarded as not present. AUTO is EMPTY_VALUE or 0. Include_* - Allows the standard indicators to be turned on/off, in terms of being in the dashboard and contributing to the alert. Box_* - Allows the position of the matrix to be changed. Property_* - Allows the properties of the standard indicators to be changed, e.g. period of moving average. Gen_alert* - Allows the alert to be sent to mobile / email. Note, further details for setting inputs can be found in the manual - see Comments tab. Panel + Configurable Automation converts custom indicators into an EA that can trade automatically. - Added Property_*appliedPrice inputs to allow applied price to be set for RSI, CCI, etc. - Can now switch to chart if click on symbol or arrow on Dashboard. Note, arrow is best as will know which time frame period. If chart doesn't exist for symbol/period then one will be opened. This new functionality can be turned off by setting input Main_openChartOnItemClick to false.